Me: Rory what did you do! Me: Well since I'm behind you he is obviously staring at you! What did you do? Rory: I didn't make out with Soren if thats what your thinking! Me: 0_o I never said you did but now I am gonna keep a closer eye on you two! Me: I like to roleplay and Soren is Sora's daughter in one of my many Kh stories... as for Rory well he is a bit odd. Man, he looks like he's gonna whack somone. Me: Take one for the team, son! 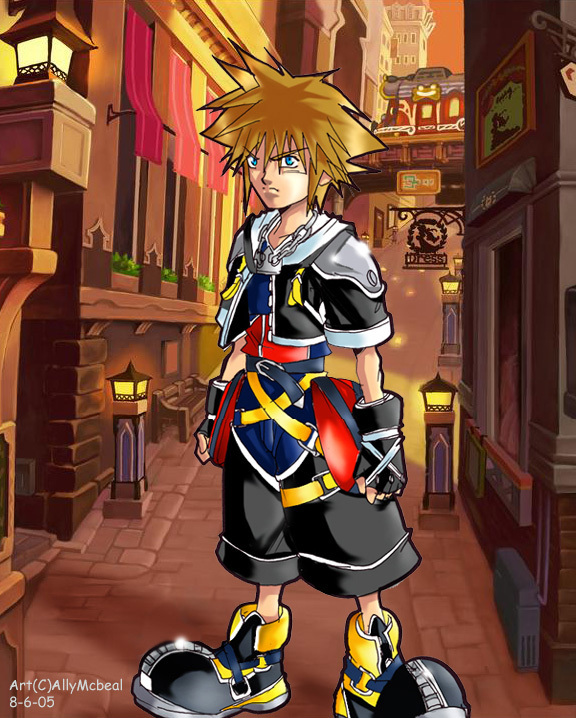 ooooooo kewl Twilight Town...*stares in awe yet again* he looks a bit mad...could it have been Seifer? j/k XD kewll piccie!! *jaw drop* That be hella good! Where did you learn to draw like that! Even the shading & background are wonderful! Fabulous work! ^.^ ne ne! What world is it *scratches behind long ears* It looks like China town to me. Even though there is no china town.